Puerto Aventuras Ok, I’ve fretted about hawkers on some of the world’s most famous archeological sites in Mexico, the current and coming crisis around water for the burgeoning local – and tourist – population draining the Yucatan Peninsula dry, and the socio-spatial apartheid exclusion of Mexicans from their legally entitled access to beaches on the Mayan Riviera at the hands of industrial tourism, so why are we enjoying our time in Mexico and especially in this small pueblo so much? You simply have to love the people and especially the sweet sounds of the street in the community. I’m not saying it’s for everyone, but sound in the streets is everywhere from the pre-dawn until late in the night. 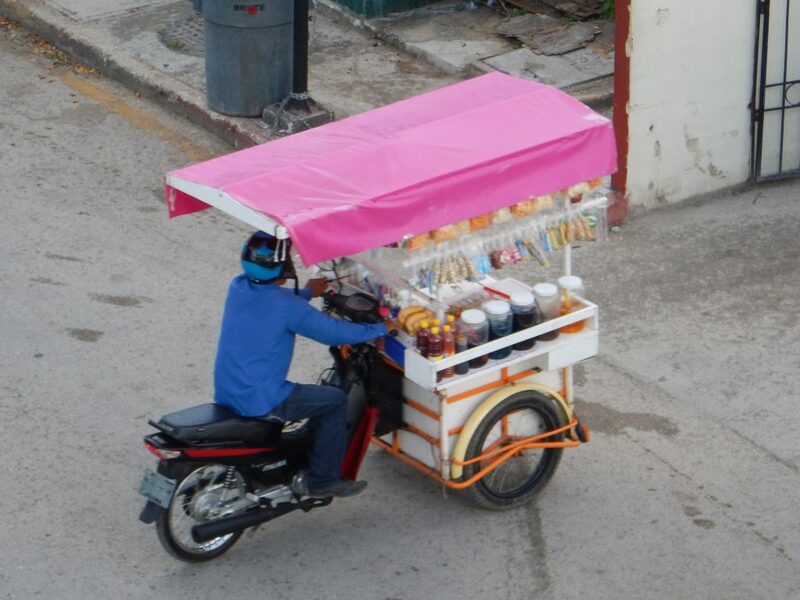 One of our favorites is the clown-car like horn for the helado or ice cream bicycle vendor as he slowly pedals up the side streets. 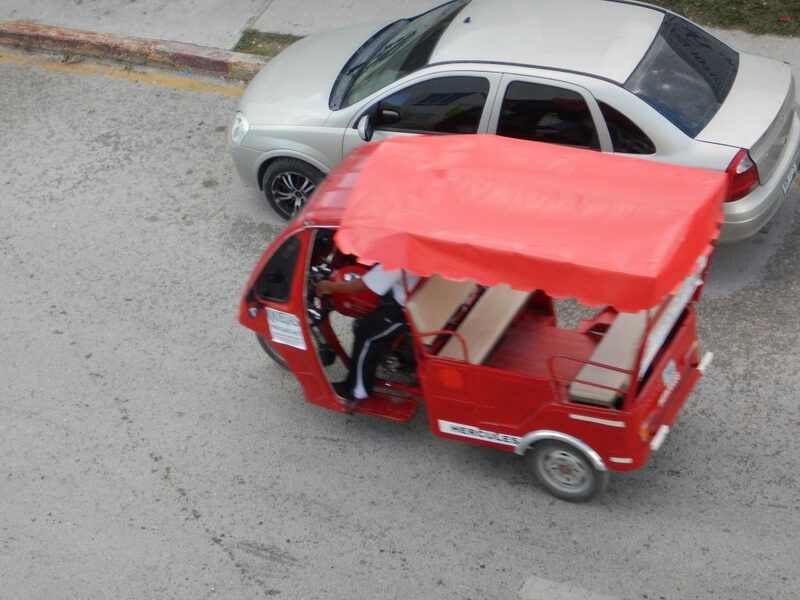 The moto-taxis like to honk at each other as they pass on the street with a toot-toot wave of their own to their fellow drivers. The collectivo jitneys picking up service and hotel workers, already uniformed to head for neighboring resorts up and down the coast, all have a distinctive horn as they begin before 5 am and drop off after nightfall. There is music everywhere in a low key battle of the bands from various businesses and casa to casa, house to house, as any walk along the few streets lined with small houses will greet you. The music is delivered, almost as a community service, from boom boxes in the front patios amidst cooking grills and hanging laundry in a symphony provided to someone’s own taste. In other houses, the streets are lit with the reflections of television screens from inside the front door, always on, but rarely being watched it seems. Everyone is in the street all the time. Walking to work and walking back. Children playing. The sidewalks are for show, the street if for travel. When business is slow, a plastic chair sits in front of the open doorway of the establishment as the proprietor watches – and listens – as the world goes by. And, then there are the loudspeakers built into the trunks of cars or on top of pickup cabs or protruding from back windows. The is a community outside of the range of television and internet advertising, so the hawking, whether for politicians or goods and services, is loud, direct, and sometimes even funny. In Mexico City we fell in love with the song of the junk dealers driving up and down and looking for whatever might be ready for them. In Puerto Aventuras, bread, vegetables, and fruit all have their carts or bicycle vendors with their own songs and shouts. For several mornings we have heard a sermon of sorts down the block for an hour or two. No one minds. People proceed calmly within the cacophony of sounds. After a while it all becomes natural in the way one tunes out train whistles and ship foghorns near the train tracks and along the Mississippi River where we live in New Orleans. All of these are the sounds of security, safety, and community, and a reminder of how all of our communities may have been when they were loud with people out and about, rather than locked behind closed doors. This entry was posted in International and tagged mexico, Puerto Aventuras by Wade. Bookmark the permalink.